Since early this spring, I haven't been very thrilled with the local birds. My former feathered friends decided to become insanely obsessed with constructing massive nests all around the house, like in the grill (nightly), across the entire awning, in vent pipes, and countless other obnoxious spots. I'm surprised they haven't flown off with my car yet... or me! 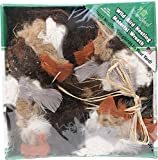 However, if you're a bird lover with normal, courteous birds hanging around your yard, then this this cool new Nesting Material Wreath will help them easily find materials to make their nests. This rustic outdoor wreath is made with a refillable blend of feathers, string, cotton, hemp, and Aspen fiber and will be helpful to more than 50 North American nesting songbird species.